Our loveable new lamp series FLÄKS unites Domus‘ contemporary design with top-of-the-line quality ... and FLÄKSibility. As a wall lamp, it hangs with casual ease from a beautifully lathed oaken hook, allowing it to be moved from one spot to another with little effort. A two-tone loop made of wool felt suspends the lamp from the elegantly-shaped oak hook, which comes with five colored felt dots, allowing you to bring your own design touch into play. Attached to the square metal base, the wall lamp can be turned into a table lamp in no time at all. You simply place it on the base and done! Thanks to a magnet integrated into the oak upright, the FLÄKS attaches freely to the base or any other metal surface. Another member of the FLÄKS series family is a shelf with a built-in lamp, making the FLÄKS a home decor essential. The small, powdercoated shelf has two slits in the dropdown front edge, where two handy felt pouches attach by means of hook- and-loop strips. They are perfect for holding pens, glasses, a mobile phone, or other small items. Additional accessories are available for the shelf itself, such as a letter stand or a bowl of lathed oak. The accessories are held in place with the same cle- ver trick as the lamp itself – an integrated magnet. 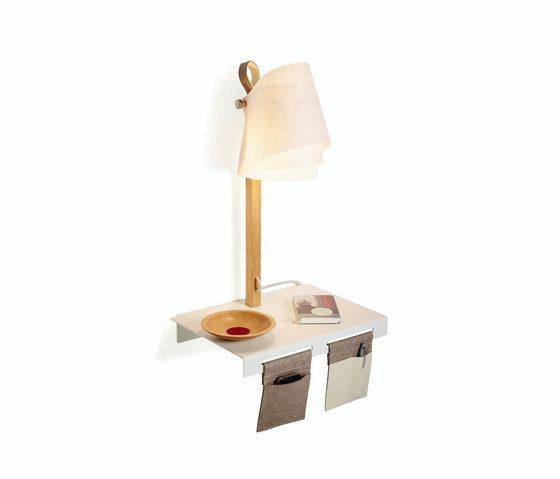 Whether in the living area or bedroom, this little FLÄKS shelf with attached lamp will pep up any interior. What We Stand For Ever since its founding in 1966, DOMUS Light is all about the dedicated, competent and passionate development of new products.